A Hawaiian Challah Back at Ya! Hey folks! I’m back from Hawaii!! I’ve been travelling around Europe and Hawaii and I’m finally back… What’s that? Yeah, I TOTALLY miss baking! I had the baking itch everywhere on me! It was intolerable! So, instead of a post on Europe, or an entry from one of my overdue drafts from before, I badly needed to bake and post something fresh! And new! May’s Daring Bakers’ Challenge was pretty twisted – Ruth from The Crafts of Mommyhood challenged us to make challah! Using recipes from all over, and tips from A Taste of Challah, by Tamar Ansh, she encouraged us to bake beautifully braided breads. I was sold on La Cuisine de Sarah to include healthy fruits for a wholesome bread. Fresh From the Oven‘s challenge this month was for fruit breads! Well, can’t really say no to that, can I? And so, to kill two birds with one stone…..
I’ve love love love Jewish bread and was excited to make a Challah. Initially, I thought it was pronounced CHA-la (IPA: tʃɑlə) instead of HA-la (IPA: ˈxɑlə). The IPA (International Phonetic Alphabet) will give you a more accurate pronunciation due to the first syllable not being a native English sound. I probably would if the eggs OR oil were to be omitted, but one thing has to stay for sure.. And that would be the beautiful braiding / swirling on the bread! Anyway, I decided to alter a traditional aspect of the Challah – raisin fillings. Since I just got back from beautiful Hawaii, I decided to create a tropical filling of dried mangos and dried PINEAPPLES! mmmm! – In a large bowl, whisk together the yeast and 3/4 cup of the flour, then whisk in the warm water until smooth. Let the yeast slurry stand uncovered for 10 to 20 minutes, or until it begins to ferment and puff up slightly. – Whisk the 2 eggs, oil, salt, and sugar into the puffed yeast slurry until the eggs are well incorporated and the salt and sugar have dissolved. – Using a wooden spoon or a kitchen aid on the hook pedal, stir in the remaining 3 cups flour all at once. – When the mixture is a shaggy ball, scrape it out onto your work surface and knead it until smooth and soft, no more than 10 minutes. – Roll each portion and then flatten it out, about 14 x 5 inches. – Insert fillings, and seal them by rolling them up and pinching the ends. I failed to achieve Lisa’s beautiful swirls because instead of rolling them up to seal, my fillings were mostly centred in the middle of the dough! – Here’s my favourite part!! If you need help with braiding, refer to this video http://www.ehow.com/video_2341034_baking-four_strand-challah-bread-loaf.html provided by Lisa. It’s really easy as long as you follow the mantra. “Over one, under one, and over one”. I braided my Challah on a silpat on a baking pan to avoid the hassle of having to transfer it later. You can also use parchment paper if you prefer. Let your braided loaf double for about 1 – 1 1/2 hours and cover with plastic seran. – Preheat your oven at 350F degrees and bake your Challah at 350F degrees for about 20 minutes. Enjoy your Challah! Oh, and guess what, it’s the Sabbath Day today! Alright guys! 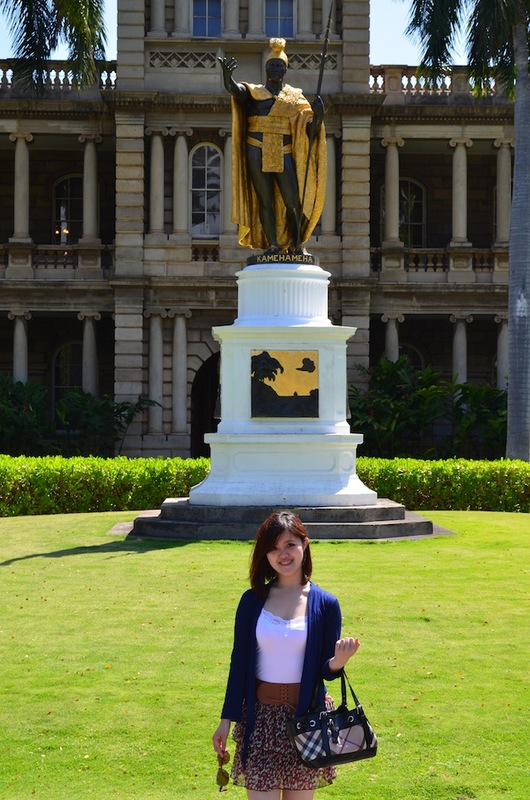 I promise I will blog about Europe and Hawaii… soon I hope! hahaha. There’s just over 3000 pictures to sort through!! Yeah, can you believe it?? I don’t even know how I took so many pictures in 2 weeks. omgg..
That looks so good – fantastic sounding filling! Thanks for your inspiration and recipe Lisa! I always love your wonderful ideas on your blog! They’re always so full of passion and creativity! I can see that many bakers took on your idea for the Daring Bakers challenge last month! haha.. 😀 First time taking part in the Daring Bakers! Can’t wait for this month’s! It shall be spectacular! oooooh, what a yummy combination! Fabulous looking challah! Thank you so much Marcellina! I can’t wait for next month’s challenge! Yours looked great too! This looks fantastic! You never stop to surprise me with your wonderful food and baking. Just amazing!!! Thanks Asmita!! You’re always so kind with your words! Awesome job!! I love the tropical theme you gave to the challah, I bet it was delicious!!! haha.. Yup! Chocolate definitely goes with everything! Gorgeous challah! Love the filling. I doubt you’d ever have leftovers but it would make a fantastic french toast! that flavor combination sounds wonderful! i’ve been on a pineapple kick lately, i could totally go for a slice of your challah! oooh! Thanks so much! i’m glad you liked it! Yeah! Pineapples are like a hidden fruit treasure! We don’t use it too much in baking but they sure are delicious! Thanks very much Bindiya! Yours looked fabulous too! Absolutely loved the topping! Thanks Tandy! Yeah! FRENCH toast would be so delicious! Oooohhhh – I love the fruits you chose – the Hawaiian inspiration is, well, inspired! Great recipe choice, too (I drooled over Lisa’s, too!) and beautiful job braiding. You knocked this one out of the park!! Thank you! I agree! Lisa’s idea was fabulous! I only wished my swirl was as gorgeous as hers! haha.. Yours looks so wonderful as well, and you managed to get some beautiful swirls out! Love it! Oh my, this sounds so delicious!! YUMMY! hehe.. yeah! You’re such a huge fan of pineapples Mr. Chu! Thanks Korena! Loved your gorgeous Challah too! Your braiding was so neat and perfect! Every strand in perfection! 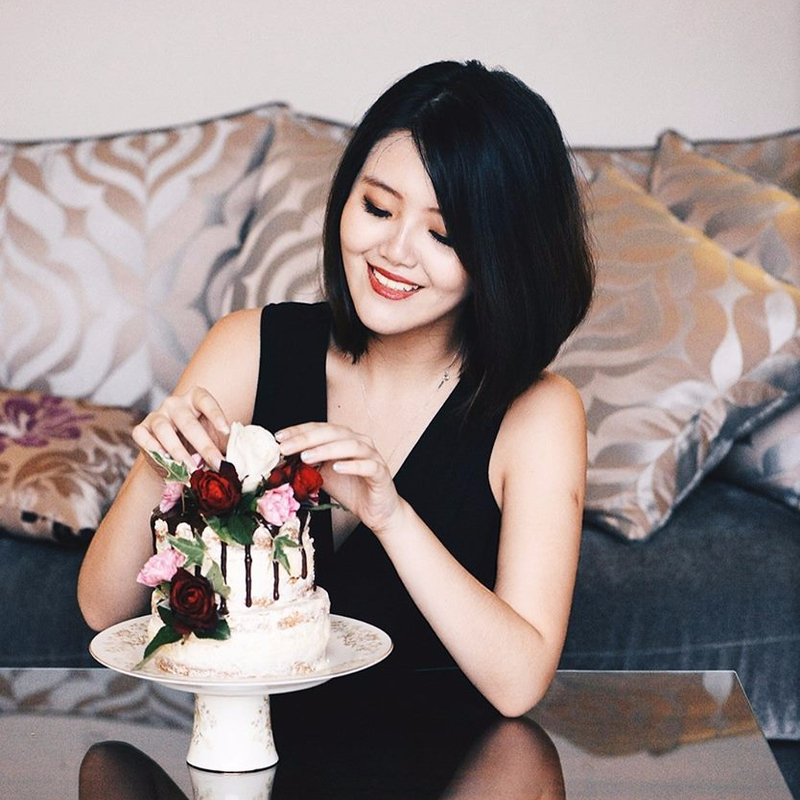 Will definitely be visiting your blog more! What an awesome vacation!! 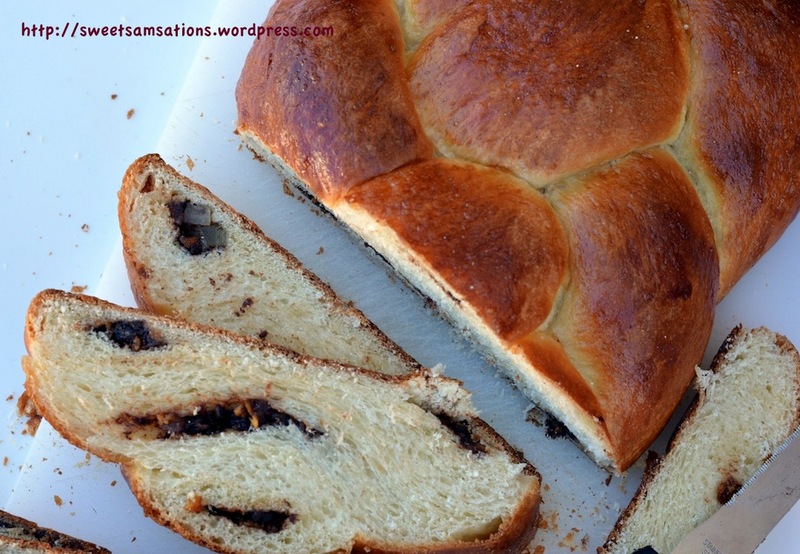 Yum, your challah looks delish and definitely a good addition of dried fruit! I’m sure you figured out that mahalo does not mean trash 😉 lol! Nice braiding skills! Very nice bread. Well your absence from the kitchen did not have any impact on your culianary skills at all-the challah looks picture perfect. Also, I am glad Hawaii gave you the inspiration for the add ins-lovely tropical flavors here-yum! Hawaii is such a paradise, definitely a great place to vacation! Welcome back. Thanks Tina! It was my first time in Hawaii and definitely won’t be my last! I really enjoyed my stay there! Everyone was so nice and friendly too!! 🙂 Thank you! I should have come out of DB retirement for this one! Beautifully done! Welcome back! This challah looks wonderful. Thank you!! Will be posting more stuff up soon! definitely! Those are such delicious flavours! Thanks! Your bread is beautiful! And I know that braiding can be tricky,so I am super impressed – and the fillings, perfect for a little return to reality post-Hawaii, eh? I love Hawaiian bread. It’s so fluffy and sweet. No wonder you were so inspired. 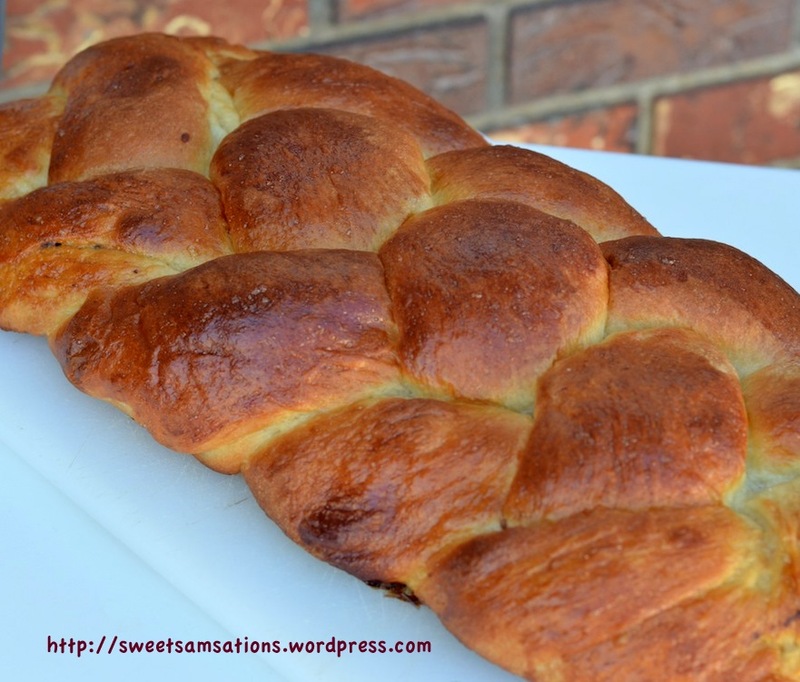 Great looking challah, beautiful braiding. Looking forward to reading about your trip. Worth getting up early and getting your baking chops down. Just gorgeous. And glad you loved Hawaii – it is paradise. And so is the recipe. Welcome back. What a fabulous creative challah! I am all about this bread. ALL ABOUT IT. Glad you had a super trip! haha.. thank you Heather! I think blogging about food is so much easier than about a trip! This post is taking me foreverrrrr! haha..
Hi Sammie, welcome home, and sorry I have been MIA. I have had a lot of stuff going on at the home front – and was barely able to keep up with my blog. Anyways, so jealous of your trip to Hawaii… but more so of this delicious looking filled-challah you posted!! I made homemade challah before, but never filled them. What a great idea. Thanks for sharing. Your challah look fabulous! I so very much want to go to Hawaii, and I think your challah might be the closest I get for a while. I hope that every bite was as tropical and delicious as it looks! Thank you for bakin with me this month! Welcome home!! I hope you do post about your travels!!! I love challah bread. My mother-in-law makes the worlds best challah hands down. I love going to her for a meal because I always know there will be some! Your challah look amazing. Love the filling you used. So unique. It must have been delicious. If I went that long without baking, I”d definitely crave it as well! Gorgeous bread to get back in the kitchen with! Thank you Joanne! mmm.. After looking at this post again I have a craving to make more bread! 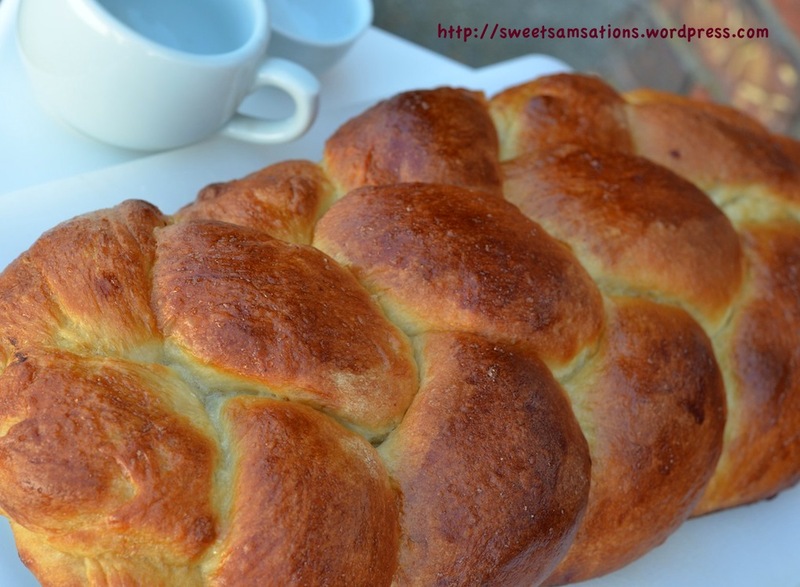 Lovely Challah photos and cute photos of you from Hawaii. My first time here and I feel your enthusiasm and passion for baking. What a great idea to combine the fluffiness and gorgeous shape of challah with exotic fruit. Thanks Sally! I’m always happy when my bread turns out fluffy!! hehe.. Welcome back Sammie! I wish I could travel with you – I’ve been to Hawaii once and Europe ZERO!!! lol. I look forward to your travel posts. 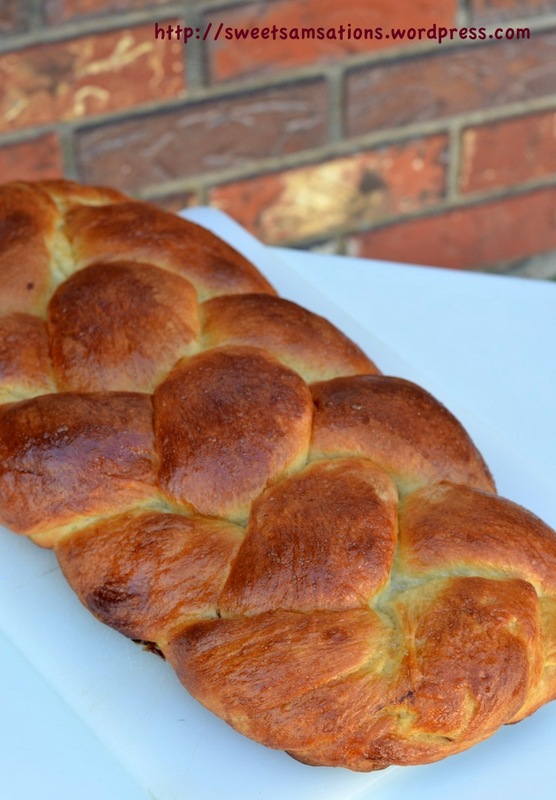 Now you are amazing you start baking right away… This Challah looks perfect! I have never had bread with all the filling ingredients in it… see this is why people bake for customization. I want your Challah! 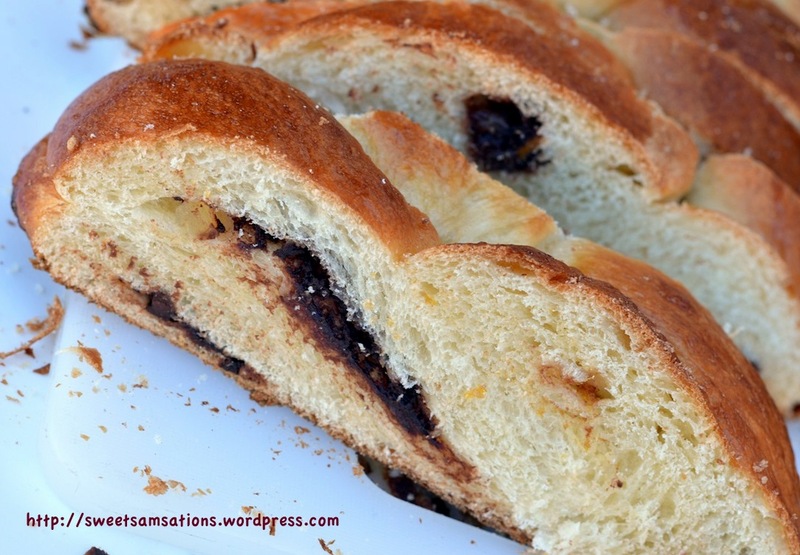 It looks like Greek Easter Bread and it;s amazing! Wow Sammie, such a nice loaf and I love the flavors in it…I see that you brought back all the tropical flavors from Hawaii…absolutely gorgeous….by the way, welcome back! Wow, this bread look so good! Well done. Thanks Sonia!! I’m totally looking over all your bread recipes now and so tempted to just make ALL of them! hahaa.